Among the musical treasures in the British Library is MS Royal 8.g.vii, a sumptuous choirbook prepared for Henry VIII and his first queen Catherine of Aragon. 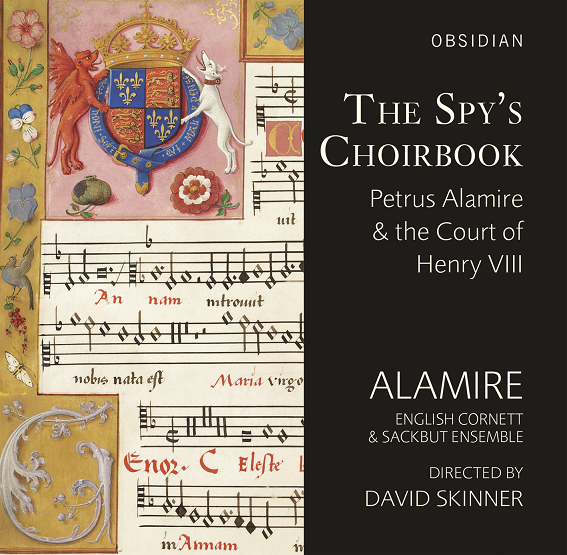 It was produced by Petrus Alamire, who not only headed one of the finest musical scriptoriums of the age but acted as a spy for Henry against Richard de la Pole, a Plantagenet claimant to the English throne. The choirbook, gifted to the royal couple in around 1516, contains 34 motets, many of them unique to this manuscript and includes masterworks by the leading French and Franco-Flemish composers of the age including Josquin Desprez, Jean Mouton, Heinrich Isaac, Antoine de Févin, and Pierre de la Rue. When David Skinner founded his crack vocal ensemble in 2005 he named them after Petrus Alamire; one of those extraordinary figures of the 1500s who turned their hand to whatever might keep them afloat on the turbulent seas of political upheaval and courtly intrigue. An illuminator, scribe and composer-musician seeking safe harbour amongst the various northern-European courts he dabbled in a little espionage on behalf of Henry VIII. After nine critically acclaimed releases, Skinner’s group now pays tribute to their namesake with this complete performance of Alamire’s finest legacy, the exquisite choirbook he once presented to Henry and is now held in the British Library. A collection of 34 motets celebrating the glories of Flemish polyphony with masterworks by Josquin Desprez, Pierre de la Rue, Jean Mouton, Antoine de Févin and a smattering of fine works of unknown provenance, some of which here receive their first recording. The choir is superb with impeccable intonation and the ideal timbre for this repertoire, finding the right compromise between modern polish and period tang, maintaining clarity of line with just the right bite in the texture and avoiding the bland results of the overly-blended. Some may crave the raw excitement of Graindelavoix’s account of Doleo super te or the flamboyant colorations of Huelgas Ensembles’ Dulces exuviae but Skinner’s choices are sensible and will serve as reference versions for years to come. The addition of instrumental doubling adds body to the grander pieces and the playing is astonishing in its security; the blend is seamless while providing a vibrancy that tickles the ear. The booklet is a model of lucid scholarship with insights on instruments and interpretive manner while the recording is immaculate with just the right buzz from the sackbuts and a touch of reverberation to add space while not clouding the polyphony. An admirable release.